In our modern society, many smart consumers do their research before making a purchase. The process of investing in a new service or product involves research and consideration to ensure that you get your money’s worth. North Dakota drivers hoping to find the best truck accessories for their ride can rest easy knowing that they have invested in the best products from a knowledgeable and caring staff. One groundbreaking product many drivers benefit from is LINE-X. This spray-on liner works to bond with the surfaces of your truck at a chemical level, delivering unsurpassed protection for decades to come. 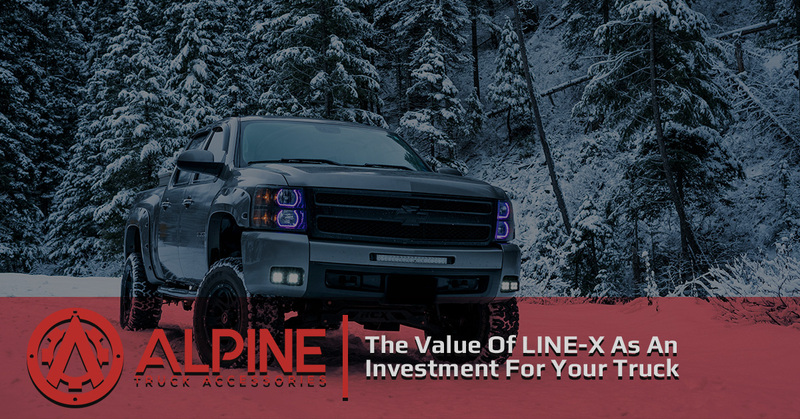 If you’re looking for LINE-X services in Williston or the surrounding areas, Alpine Truck Accessories is here and ready to help. Our truck shop is proud to be an authorized LINE-X provider, delivering high-quality results that are worth every penny. If you have been curious about LINE-X paints but have not decided to invest yet, read up on this blog post before scheduling a consultation with our truck shop! If you spend money on a product or service, you are expecting reasonable returns for the purpose of your investment. Drivers who want the best for their buck can benefit from our LINE-X services. Alpine Auto Accessories can deliver exacting results for your ride, protecting your surfaces from dents, scratches, stains, corrosion, and more. No other spray-on liner delivers complete protection at all levels, keeping your vehicle safe from nearly every conceivable danger. The initial cost of your LINE-X spray will quickly be recouped by the performance and protection. Many wise investors will look at the longevity of their returns to determine whether it is worth the initial costs. If your truck upgrades are expensive, it is expected of them to last longer. North Dakota drivers not sure if a LINE-X spray is ideal for them need to consider the fact that this spray-on liner is made to last a lifetime. In almost all cases, this spray-on service will outlast every other part of your truck. Our truck enhancement team is proud of the quality and precision of our car-coating services, and will happily LINE-X any truck accessory you have. One key measurement of any investment is the risk you are taking. Many times, high-risk opportunities come with better returns, yet turn away many weary investors. If you are trying to budget for a spray-in bedliner for your truck, keep in mind that LINE-X coatings are formulated to last a lifetime. The coverage offered by LINE-X and our truck shop ensures that you are left with complete peace of mind on the road. LINE-X paints are tough and durable, but if you notice peeling, cracking, or bubbling, be sure to reach out to our team, and we’ll take care of the problem, no questions asked. Investing in the best truck accessories can do much to protect your ride, and our LINE-X services in Williston ensure that you are outfitted with the best brand on the market. We’ll work hard to ensure that your investment is safe, delivering years of quality performance that make the returns well worth the cost. Contact us today to learn more, and be sure to schedule your appointment with our truck shop for long-lasting results!